Keeping our members, friends and neighbors in the loop! Courtesy of our friends at CONA St. Petersburg! 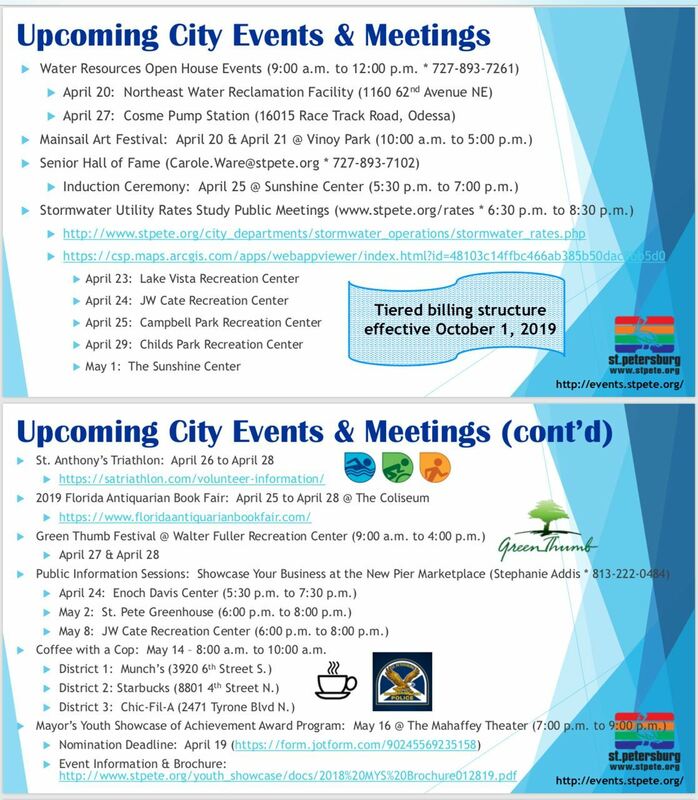 A public open forum was held on April 4, 2019 at SPC Allstate Center regarding the Repurposing of lanes along 34th St (US 19) from 22nd Ave South to 54th Ave South. Follow the link below for details. Come out and support the arts and our gifted students! Follow this link (may need to copy and paste into your browser window) to read about the Saint Petersburg Chamber of Commerce approach to bringing more affordable housing options to our rapidly growing city. As part of the Council of Neighborhood Associations (CONA) Leadership program, participants are exposed to a host of City Government offices, leaders, and official proceedings as they learn about our city and what makes is tick. GPPCA Board Member Stephen Waters is currently participating in this invaluable program and compiled these notes from a recent CONA session. These notes are an example of how GPPCA benefits from not only his involvement as a 'student' but how the Association broadens its civic outreach beyond the neighborhood. 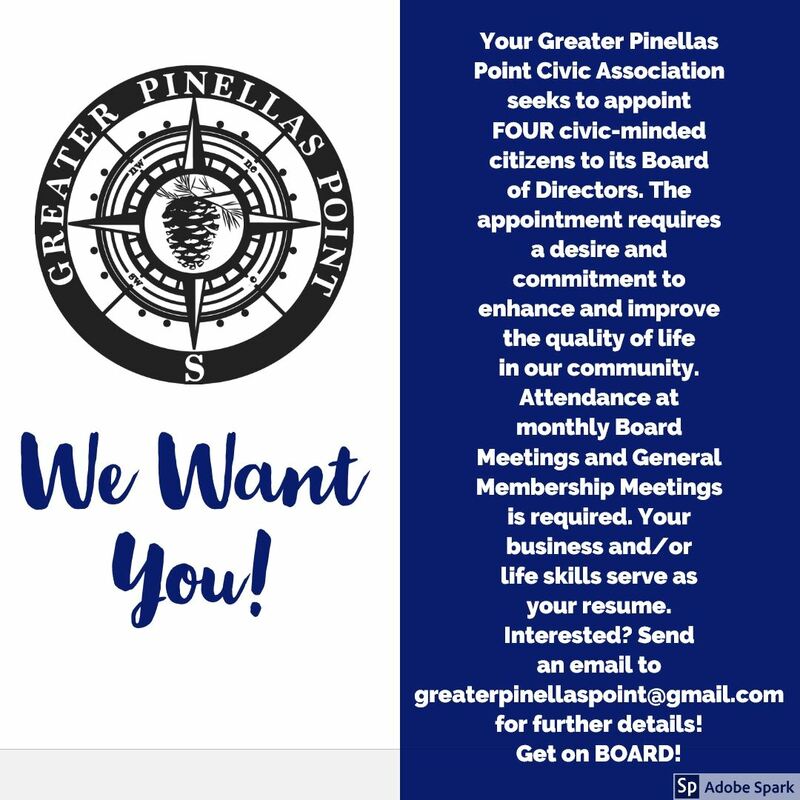 COUNCIL OF NEIGHBORHOOD ASSOCIATIONS OF SOUTH PINELLAS COUNTY, INC February 20, 2019 Sunshine Center 7:00 p.m.
ST. PETE EARTH DAY: Lucinda Johnson, Executive Director provided details. Will take place at Williams Park on April 13, 2019, from 10:00 a.m. until 5:00 p.m. Space will be available for appropriate vendors. Boyd Hill will have presentations regarding local wild animals (possum, coyote, etc.). There will be art, food, vendors and a tree and plant giveaway. Go to its Web site for vendor info, a vendor application and for a list of exhibitors (https://www.earthdaysp.com/). COMMITTEE UPDATES: There were brief committee updates. Leadership - completred 5th class with 39 students. Four new neighborhoods have joined CONA. 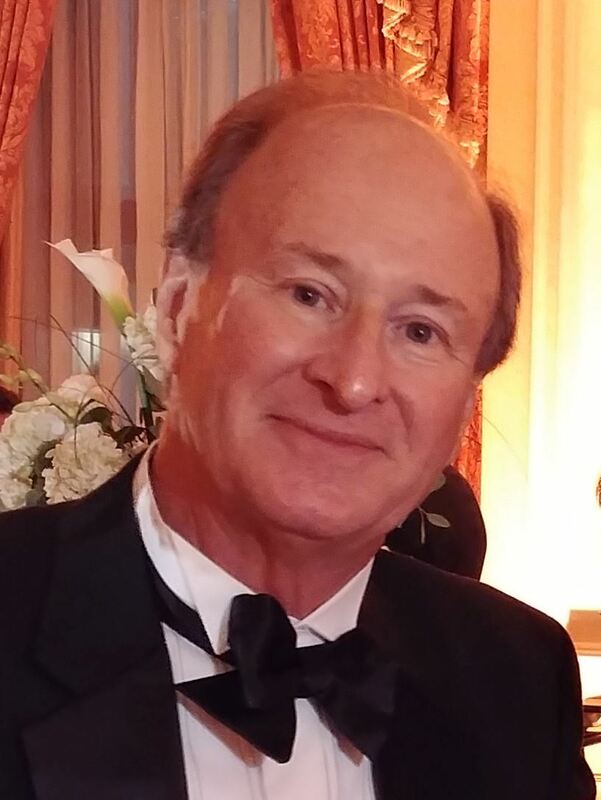 Codes - Met with City Codes staff and updates and info available on the Web site (https://conaforums.org/) although nothing is yet posted. Multi-Modal Transportation - Tom Lally is Chairman and reported that the Committee has 10 members and had its first meeting preceding the CONA meeting to set goals. COMPLETE STREETS: There was a PowerPoint update on the progress and status of Complete Streets from Evan Mory (Director, Transportation and Parking Management) and Cheryl Stacks (Manager, Transportation) with a summary from Alan DeLisle (City Development Administrator). Preliminary data shows that on MLK southbound traffic is slightly increased even though it was anticipated that the lane reduction would also reduce traffic. Southbound average speeds have been reduced to near the speed limit of 35 mpg, but northbound average speed remains unchanged at 41 mph. Biggest problem is St. Pete pedestrian deaths, which are the 9th worst in the country. Widening the bike lanes have reduced fatalities by slowing traffic even though there are more cars. Alan DeLisle pointed out that the goal is Aplacemaking@ to attract business by lifestyle and environment improvement. MLK crosswalks are still under construction but should be complete soon. PRESIDENT’S UPDATE: CONA President set a goal of visiting all association meetings (2/month). There will be a CONA table at Earth Day. Shopapalooza will be November 30 through December 1, 2019, at Vinoy Park. For vendor applications see the Web site (http://www.shopapaloozafestival.com/). Chili cook off being put on by Grand Central District with several associations competing. The Doc Webb home is being proposed for historical designation to avoid destruction and development into four or five homes (See attached). Driftwood is also being proposed for historic designation. Have You Seen The Improvements!? New Greater Pinellas Point neighborhood identity signs (5 total) were installed in June 2018 at Roy Hanna and Pinellas Point Drives, Dr. MLK Jr St and 54th Ave S, and 4th St S at Hillside Drive. The new signs were the result of nearly two years of planning that included the design, City of Saint Petersburg matching grant application compliance, codes compliance and vendor research, selection and contracting. The new logo, which features an intricate navigation compass on a vivid blue background, was inspired with the help of City staffers and GPPCA Director and project lead Danny E. White. The idea was to evoke the community's nautical environment while also paying homage to the area's abundant and signature pine trees (a pinecone is at the center of the design). GPPCA members voted on the final sign design and optimal visibility replacement locations. The matching grant funding reward was handily repaid by verified volunteer hours or 'sweat equity' that was primarily contributed by GPPCA Board of Directors and members. The old identity signs were made of wood and severely rotted; therefore, the Association opted to go with high quality, decorative, coated metal fixtures to ensure years of longevity and aesthetic appeal. The locations of the new signs was driven by mandatory compliance with City codes for signage in existing medians and roadways. Five remaining wooden signs are not currently being considered for refurbishing or replacement and will likely be removed. 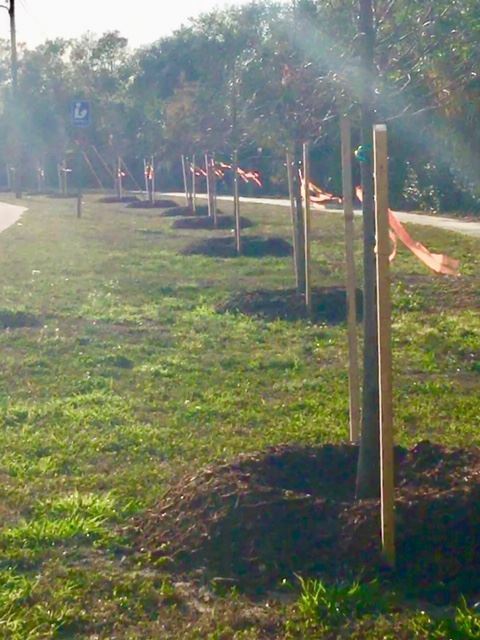 In January 2019, GPPCA Environmental Chair Beth Connor took the lead on getting professional landscaping installed at the highly visible Roy Hanna/Pinellas Point Drives median. The landscaping includes native ground cover, trees, and shrub varieties, all beautifully surrounded by islands of white crushed shells and new sod. 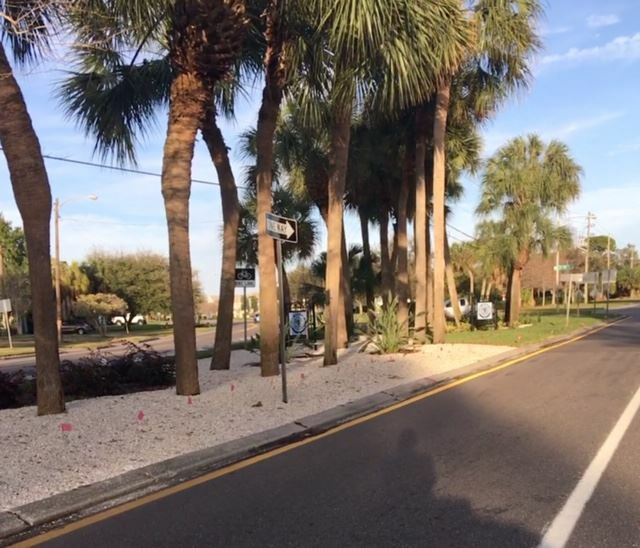 The new identity signs and the lush landscaping make for a significant and befitting improvement in an area that serves as the primary perimeter gateway into Greater Pinellas Point. The GPPCA extends heartfelt thanks to City of St. Petersburg, Florida USA, Community Services, Office of Sustainability, Parks and Recreation, Stormwater Management, Codes Compliance, City Council, and the Office of the Mayor for all of the focus, collaboration, support and hard work that makes our Greater Pinellas Point communities a truly fantastic place to call home! As the result of an ongoing collaborative partnership among the GPPCA, Bahama Shores, Lakewood Terrace, and Bayou Highlands neighborhood associations, a special meeting with the Florida Housing Coalition (FHC) was held at Lake Vista Center on February 12, 2019. 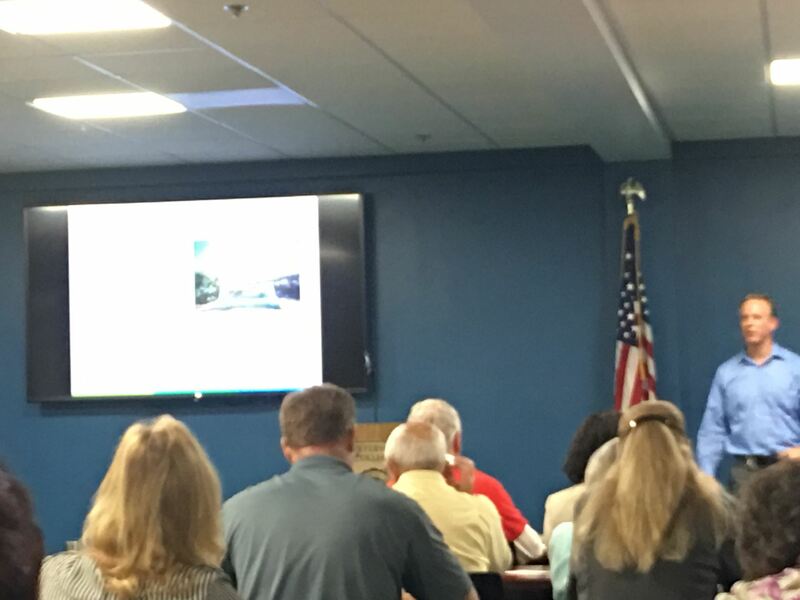 The purpose of the meeting was to give residents of the communities the opportunity to weigh in on their vision/desires for the revitalization of the Skyway Plaza Shopping Center located at Dr MLK Jr St S and 62nd Ave S in Greater Pinellas Point. The FHC has been selected by Fannie Mae to compete in a national project called the Sustainable Communities Innovation Challenge (The Challenge). The $10 million award focuses on 'adaptive resuse' of vacant commercial spaces like the Skyway Plaza. The team will explore the feasibility of adapting vacant commercial spaces into attractive and functional mixed-use apartments and co-working offices for low-income entrepreneurs. Nothing is set in stone as to what will be the end results of the initiative; however, with community input and buy-in from the property owner, Brixmor, the FHC intends to use its broad expertise to bring new life and innovation to the Plaza. Should (or WHEN!) the FHC be successful, it will lead the way for other such state and national organizations to follow. Lead by FHC Technical Advisor Mr. Ashon Nesbitt, a Saint Petersburg native, and co-Advisor Mr. Ben Torro-Spears, the FHC team put the 60+ attendees through an exercise facilitated by FHC Architect Mr. Stephen Bender where they were divided into work groups to focus on a) Retail and Business Ideas; b) Outdoor Ideas, and c) Residential Ideas. Using poster displays containing inspiring visions of what the Plaza could become, the groups compiled ideas that they had previously affixed to the displays with sticky notes. They then selected a group spokesperson and took turns going before the entire audience to present their visions. Many of the groups were united in using outdoor space for community gardens, gathering space, and play areas for smaller kids. Inside, the groups agreed on the concept of live|work (apartment) spaces, and retail opportunites for small businesses that offer locally created foods, administrative services and technology incubators. The FHC initiative is focused specifically on the 60K sq ft space once occupied by the Sweet Bay grocery store. This space is a blank canvas that will easily lend itself to helping the FHC bring its vision to fruition. For more information on the FHC and this project, please visit www.flhousing.org. Stay tuned to the GPPCA Facebook page and our website, gppca.wildapricot.org to JOIN the association and also for community news and updates. At our January 22 General Membership Meeting, Leisure Services Administrator Mr. Mike Jefferis and Natural & Cultural Areas Manager Ms. Barbara Stalbird gave a detailed presentation on the proposed expansion of Maximo Park. The expansion is made possible by a 25-year lease of land to the northwest of the existing park, near I-275S. The land is the property of the Florida Department of Transportation (FDOT) and was used as a materials staging area. The land will be cultivated to expand parking for recreational vehicles, using permeable materials to facilitate drainage and allow for easier repurposing of the space in the future. Improvements will also include the installation of solar lighting, planting native vegetation and removal of invasive species, fencing, enhancing the disc golf course, and protection of the historic Indian Mounds within the park. Also at our January 22 General Membership Meeting, Mr. Jefferis and Ms. Stalbird presented the city's plan and rationale for removing the banyan trees at the Princess Indian Mound at Bethel and Pinellas Point Drive located within the historic 'Pink Streets' community. With several opposing residents of the Pink Streets in attendance, in addition to opposing residents from the greater community, the City team presented compelling evidence that the banyan trees, which are NOT a protected variety, are causing irreparable damage to the Mound due to their 'walking root systems' that are causing gradual but consistent soil erosion, thereby threating the sustainability of the Mound. The tree canopies have proven problematic in resolving the erosion because they also block sunlight, thereby inhibiting the growth of ground cover that has already been tried without success. The solution, a matter of City authority and does NOT require citizen/association approval, is to remove the trees completely, plant native vegetation and trees that are more compatible for the sustenance of the highly regarded and historic Princess Mound for generations to come. Signage will be posted in the community to alert residents when the work commences in the next few months. In addition to the tree removal, the City is also working to create a 'virtual experience' for visitors to the Mounds throughout Saint Petersburg. Using virtual reality technology, visitors will be able to transport themselves back to various stages in time during the evolution of the Mounds... the GPPCA plans to schedule a guest speaker to attend a forthcoming general meeting to give further insight into this exciting project that will be a value add to our great neighborhood! New Year’s Day – Tuesday, January 1: Tuesday collections will be made on Wednesday. Monday, Thursday and Friday collections remain the same. Dr. Martin Luther King, Jr. Day – Monday, January 21: Monday collections will be made on Tuesday. Tuesday collections will be made on Wednesday. Thursday and Friday collections remain the same. Presidents’ Day – Monday, February 18: Monday collections will be made on Tuesday. Tuesday collections will be made on Wednesday. Thursday and Friday collections remain the same. Memorial Day – Monday, May 27: Monday collections will be made on Tuesday. Tuesday collections will be made on Wednesday. Thursday and Friday collections remain the same. Independence Day – Thursday, July 4: Thursday collections will be made on Wednesday. Monday, Tuesday and Friday collections remain the same. Labor Day – Monday, September 2: Monday collections will be made on Tuesday. Tuesday collections will be made on Wednesday. Thursday and Friday collections remain the same. Veterans Day – Monday, November 11: Monday collections will be made on Tuesday. Tuesday collections will be made on Wednesday. Thursday and Friday collections remain the same. Thanksgiving Day – Thursday, November 28: Thursday collections will be made on Wednesday. Monday, Tuesday and Friday collections remain the same. Christmas Day – Wednesday, December 25: All normal collections on Monday, Tuesday, Thursday and Friday will not be affected by this holiday.